O God of infinite goodness and mercy, fill our hearts with a great confidence in Thy Most Holy Mother, whom we invoke under the title of the Immaculate Heart of Mary, and grant us by her most powerful intercession all the graces, spiritual and temporal which we need, through Christ Our Lord. Amen. A great sign appeared in heaven: A woman clothed with the sun, and the moon under her feet, and on her head a crown of twelve stars. -- (Ps. 97. 1). Sint ye to the Lord a new canticle: because He hath done wonderful things. V.: Glory be to the Father . . . -- A great sign appeared in heaven . 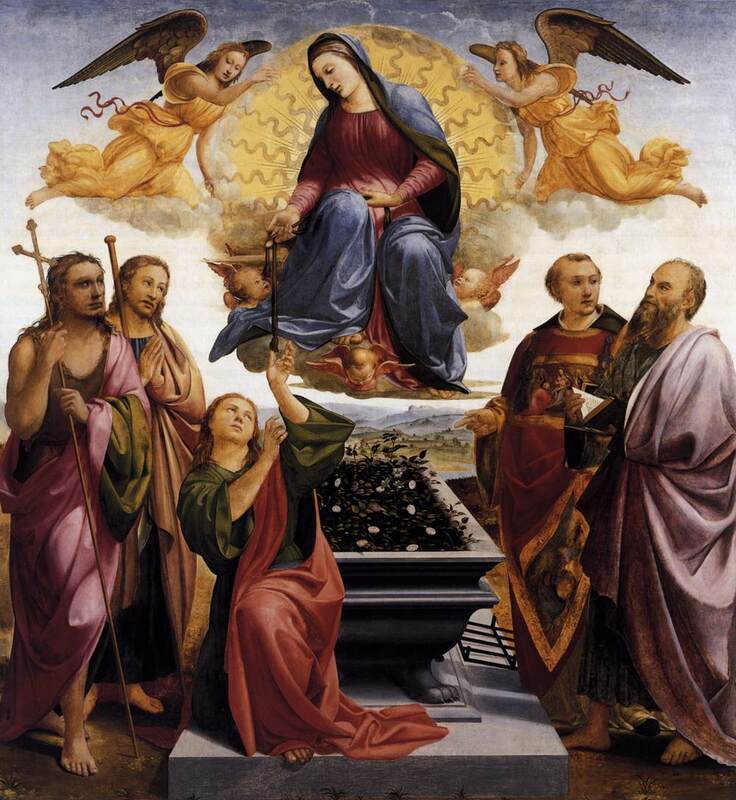 . .
Today is the First Class Feast of our Lady's triumph Assumption into Heaven, which we recall in the 4th Glorious Mystery of the Holy Rosary. In honor of our Blessed Lady, who was born and remained without defilement of sin, let us remember that today we as Catholics are required, under pain of mortal sin, to attend Holy Mass. Additionally, on this day we are required, in so far as we are able, to refrain from all servile work. 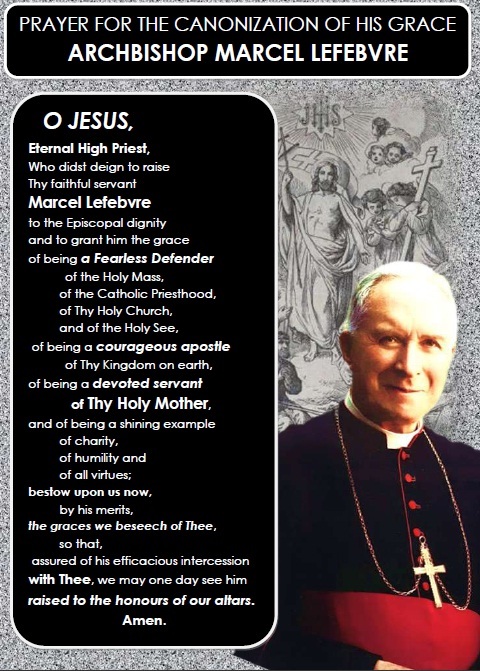 Let us in honor of our Lady and to help protect the name of the Blessed Mother of God from unjust attacks by Protestants read the writings of the Early Church Fathers, which illustrate that the Church since time immemorial has honored the Assumption of the Blessed Virgin into Heaven. If therefore it might come to pass by the power of your grace, it has appeared right to us your servants that, as you, having overcome death, do reign in glory, so you should raise up the body of your Mother and take her with you, rejoicing, into heaven. Then said the Savior [Jesus]: "Be it done according to your will" (The Passing of the Virgin 16:2-17 [A.D. 300]). Therefore the Virgin is immortal to this day, seeing that he who had dwelt in her transported her to the regions of her assumption (Homily on Simeon and Anna [A.D. 400]). The Lord said to his Mother, "Let your heart rejoice and be glad. For every favor and every gift has been given to you from my Father in heaven and from me and from the Holy Spirit. Every soul that calls upon your name shall not be ashamed, but shall find mercy and comfort and support and confidence, both in the world that now is and in that which is to come, in the presence of my Father in the heavens". . . And from that time forth all knew that the spotless and precious body had been transferred to paradise (The Dormition of Mary [A.D. 400]). [T]he Apostles took up her body on a bier and placed it in a tomb; and they guarded it, expecting the Lord to come. And behold, again the Lord stood by them; and the holy body having been received, He commanded that it be taken in a cloud into paradise: where now, rejoined to the soul, [Mary] rejoices with the Lord's chosen ones. . . (Eight Books of Miracles 1:4 [A.D. 575]). It was fitting ... that the most holy-body of Mary, God-bearing body, receptacle of God, divinised, incorruptible, illuminated by divine grace and full glory ... should be entrusted to the earth for a little while and raised up to heaven in glory, with her soul pleasing to God (Homily on the Assumption [ca. A.D. 600]). As the most glorious Mother of Christ, our Savior and God and the giver of life and immortality, has been endowed with life by him, she has received an eternal incorruptibility of the body together with him who has raised her up from the tomb and has taken her up to himself in a way known only to him (Encomium in dormitionnem Sanctissimae Dominae nostrae Deiparae semperque Virginis Mariae [ante A.D. 634]). You are she who, as it is written, appears in beauty, and your virginal body is all holy, all chaste, entirely the dwelling place of God, so that it is henceforth completely exempt from dissolution into dust. Though still human, it is changed into the heavenly life of incorruptibility, truly living and glorious, undamaged and sharing in perfect life (Sermon I [A.D. 683]). Venerable to us, O Lord, is the festivity of this day on which the holy Mother of God suffered temporal death, but still could not be kept down by the bonds of death, who has begotten Thy Son our Lord incarnate from herself (Gregorian Sacramentary, Veneranda [ante A.D. 795]). The evolution of at least some dogmatic teachings of the Church. A fundamental error with modernism and those who adhere to it (i.e. liberal Catholics), is that they refuse to embrace extra ecclesiam nulla salus ("outside of the Church there is no salvation"). Pope Innocent III declared at the Fourth Lateran Council in 1215: "There is but one universal Church of the faithful, outside which no one at all is saved." His Holiness Innocent III unequivocally declared that all men must belong to the Church founded by our Lord Jesus Christ in order to be saved. Period. Subsequently, Pope Boniface VIII made the matter even more clear when in 1302 he unequivocally declared, "We declare, say, define, and pronounce that it is absolutely necessary for the salvation of every human creature to be subject to the Roman Pontiff." (Unam Sanctam, 1302.) Read those words carefully: absolutely necessary. And these remarks are not the only ones pronounced by the Holy Catholic Church. As I've written previously in Can Non Catholics be saved?, The Church continues to teach that outside of the Church there is no salvation. Period. 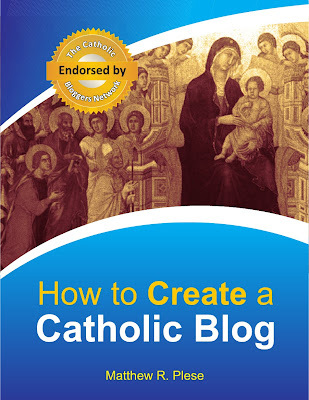 Oh, then but what about the Catechism of the Catholic Church (2nd Edition) and the statements of Paul VI and his successors? Some might object and say that the Church has changed its position. But this can not be so. Liberal Catholics fail to understand that the Church is unchanging in matters of Faith and Doctrine. If it is true that in the past salvation was possible only for Catholics and if this is not true now, then the Faith has changed. But the Faith can not change. "Christ is the same yesterday, today, and forever." If the Church changed this matter it would be a liar and, as the Bride of Christ, it would seem that Christ Himself has lied to those in times past. So then, what are we to do? Has the Church changed? Has the Faith changed? And, if so, then Christ is not unchanging. Stop. The simple answer is that the Church in Her glory and perfect Truth has not changed. Salvation is still only possible to those within the barque of Peter. The Catechism of the Catholic Church (2nd Edition) in paragraph 1260, states, "Every man who is ignorant of the Gospel of Christ and of his Church, but seeks the truth and does the will of God in accordance with his understanding of it, can be saved." 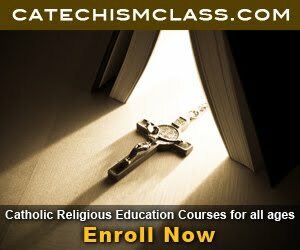 But herein enters the problem with the 2nd Edition of the Catechism - unlike the unequivocal teachings of the Holy Fathers of times past, the teachings in the Catechism are vague and unclear. Just what does the Catechism mean by "ignorant of the Gospel" and what is "seeking truth"? Some would argue that all men seek the truth since all men by their nature are inclined to know the Truth. Therefore, it would seem that all men are saved since the Catechism states that all men who seek the truth are saved. What is worse and most dangerous for the Church and the salvation of mankind is that clergy are lured into this argument and accept it without evaluating the soundness of the premises in the argument. Let's look at what do we mean by "Truth" and "ignorance." What is the truth (Quid est veritas?). We, if we are grounded in sound catechesis, we will declare that Jesus Christ is the sole way, Truth, and life (cf. John 14:6). And what is "ignorance." The Church has clarified this to describe "invincible ignorance," which unlike "ignorance" has a rather precise meaning. Invincible ignorance refers to the state of persons (such as pagans and infants) who are ignorant of the Gospel message because they have not yet had an opportunity to hear it. The first Pope to use the term officially seems to have been Blessed Pope Pius IX in the allocution Singulari Quadam (9 December 1854) and the encyclicals Singulari Quidem (17 March 1856) and Quanto Conficiamur Moerore (10 August 1863). The term, however, is far older than that. St. Thomas Aquinas uses the term "invincible ignorance" in his Summa Theologica, which has been a foundation for the Thomistic Philosophy on which the Church's teachings are based. In short, invincible ignorance only applies to those who, through no fault of their own, were ignorant that the Church existed - people who were ignorant of the fact that there was a Jesus Christ. Yet, in our modern era, with missionaries preaching around the world and with a globalization of the world, people in diverse places have been connected through technology in ways never before possible. People around the world have the ability to read this blog now with only an Internet connection. What does this mean? It means that with access to such a wide variety of information, it is highly unlikely that many people even exist who are invincibly ignorant and have never heard of our Lord or the Church. It was Archbishop Sheen that said, "There are not one hundred people in the United States who hate the Catholic Church but there are millions who hate what they mistakenly believe it to be." Some would counter that because these millions are ignorant of what the Church really is that they can still be saved. Rather, now that we have clarified invincible ignorance, we can assert that these people - though ignorant - are not invincibly ignorant because they have access to the Gospel. In fact the Church has always and continues to profess that these souls of the invincibly ignorant are spiritually united to the Church so, nonetheless, they are still saved through the Church. Outside of the Church there is no salvation. Those who teach this doctrine false - both clergy and laity - do great harm for souls and possibly have prevented souls from converting, thus rejecting salvation. This error of liberal Catholics must be countered. It must be faught. This false teaching is one of the six principles that seek to undermine the Church and is none other than an attack by the devil, which has polluted the minds of even ordained members of the Church. Let us with charity fight this error of our times that is undoubtedly leading souls straight to hell. Further complicating the matter, in our times even the Holy Father of recent memory (John Paul II) caused great scandal to the Faithful with his aapperance at Assisi and many of his statements, where he seemed to indicate, at least through example, that those of other faiths can be saved. While I will not at this time examine this error (that is for Part 3), it nonetheless only illustrates how deep this error has sunk into seminaries over the past century so that now even members of the hierarchy of the Church seemingly sin against what the timeless Church has always taught. To support religious indifferentism, in essense, violates the First Commandment since, by such support, we deny that there is One God, through whom salvation alone comes. True incultration is the answer. We do not force our Lord and the Faith to conform to our cultures. Rather, we all conform to our Lord Jesus Christ. While I do not unequivocally endorse all of the statements by Michal Semin, Director of St. Joseph Institute (Prague), I do agree with his statements concerning this issue when he states, "Many traditionally-minded Catholics are loosing, due to their mental or emotional embracement of the motu proprio, Summorum Pontificum, which to a certain degree liberalizes the use of the 1962 Missal, their awareness about the doctrinal nature of the crisis in which we are living today. 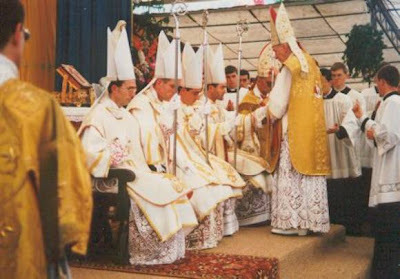 Even if the motu proprio would provide a healing in the field of Catholic liturgy, which is debatable, one cannot forget that lex credendic precedes lex orandi. The main battlefield is in the field of doctrine, not liturgy..."
The following series of videos shows a reenactment of the Reconciliation of the Penitents, a liturgical act performed on Maundy Thursday before the Mass. The Liturgical Act was found in early 16th century books. 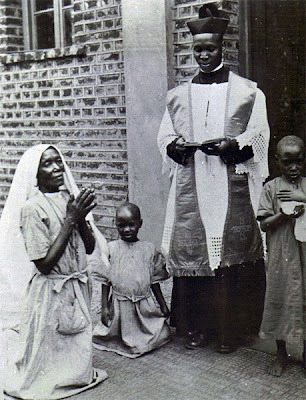 Those whose sins were of sufficient magnitude were expelled from the Church on Ash Wednesday and re-admitted as part of this Rite on Maundy Thursday. "Venite, venite, venite, filii; audite me : timorem Domini docebo vos." ("Come, children, hearken to me: I will teach you the fear of the Lord. "), sings the priest to begin the ceremony. For additional information on this reenactment, please see this PDF from the National Museum in Wales. Yesterday was the last day of July and the Month of the Precious Blood has ended. August is the Month of the Immaculate Heart of Mary. Through the Sacred Heart Devotion, we remember Jesus's love for us. In the Immaculate Heart, we unite our hearts with Mary in loving God. May she guide and guard us while bringing us closer to the Heart of her Son. 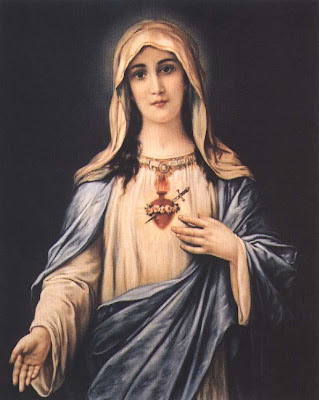 The image of the Immaculate Heart goes back to Luke 2:35, as we recall the sword of sorrow that pierced Mary's heart. It was our sins that crucified Our Savior and which tore a sword of sorrow through his dear Mother Mary. As Mary revealed at Fatima in 1917, the thorns surrounding her heart are a symbol for sins. Each time we offend our Lord and crucify Him, we further increase the pain His Mother felt beneath the Cross. At Fatima Mary said: "Jesus wishes to establish devotion to my Immaculate Heart in the world. I promise salvation to those who embrace it. 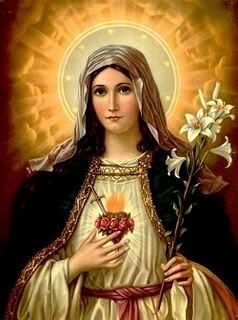 Tell everybody that God grants graces through the Immaculate Heart of Mary, and that they must ask them from her. Tell them that the Heart of Jesus wishes that by His side should be venerated the Immaculate Heart of Mary. 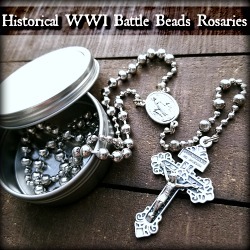 Tell them to ask peace through the Immaculate Heart of Mary; God has placed it in her hands." O Jesus, through the Immaculate Heart of Mary,I offer you my prayers, works, joys, and suffering of this day in union with the Holy Sacrifice of the Mass throughout the world.I offer them for all the intentions of Your Sacred Heart: the salvation of souls, reparation for sins, the reunion of all Christians;I offer them for the intentions of our Bishops and of all Apostles of Prayer and in particular for those recommended by our Holy Father this month.